The project consisted of several parts. The first part contained 30 cards with a description of the places and events in the Netherlands. Museums, markets, mills, shops, waffles and bicycles to rent. On each card, you could read comments and tips of a well-known travel blogger. There was also interesting information about KLM and Schiphol airport. In the second part of the project users were invited to play the game — to choose which one of the two pictures was shot in Amsterdam and thereby find out how well they know this city. The participants could also win 2 tickets to Amsterdam, by answering the question: "Why should you win tickets to Amsterdam?”. 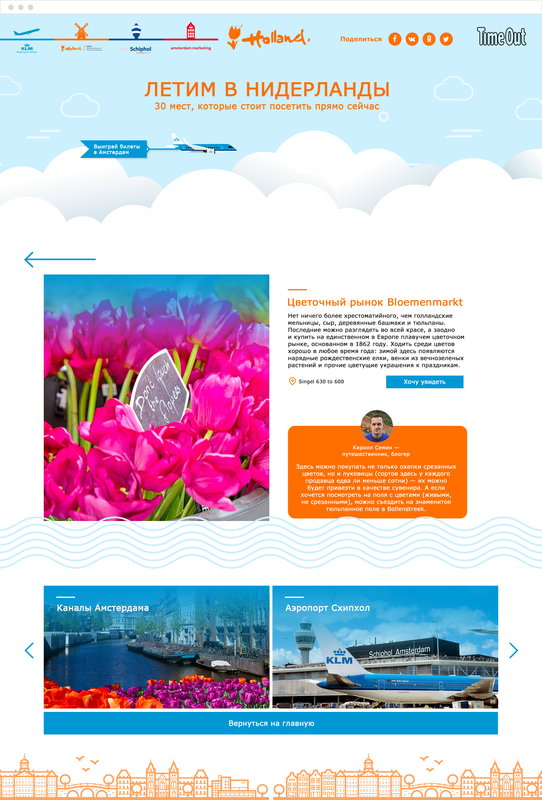 In the design of the site Holland Alliance and KLM corporate colours were used. There were animated elements as well, associated with the flights and the Netherlands: moving clouds and waves, a flying plane, rolling bikes. Place description with a tip from the travel blogger. At the bottom of the page there were quick navigation cards between different places and a button with the option to go back to the main page. There is a bike at the bottom of the page which represented the timeline of the game. With every answer, the bike moved forward and you could keep track of how many questions were left to finish the game.